Great Escape: Beautifully spacious home tucked in the trees a short stroll to downtown Saugatuck. Relax on the wrap around porches or in your personal movie theater! This large, beautiful home has the space and luxury to make your Saugatuck vacation everything you dreamed! New for 2018: Wonderful outside recreation area. Designated fire pit area with propane fire. 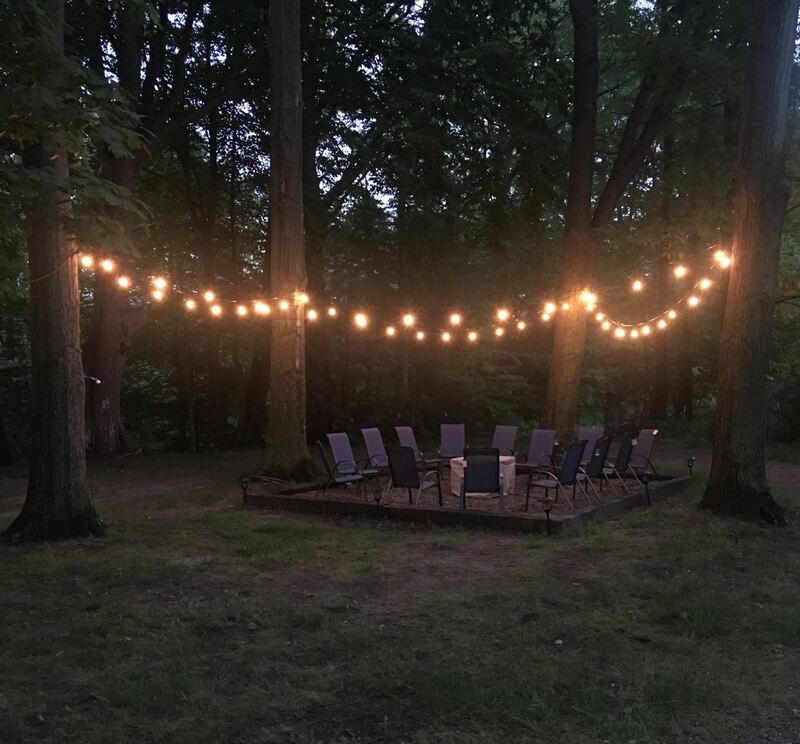 You will want to spend all your time hanging out in this space. Escape to your perfect, Saugatuck luxury vacation with your whole family at Great Escape! This gorgeous home boasts 5 private bedrooms and additional sleeping space throughout the sprawling manor. Savor your coffee on one of the many decks and balconies in the morning while taking in the serene nature views and listening to the babbling brook. Inside there is plenty to do for everyone, from the plush movie theater seating with 110" movie screen and game room, to the spacious living and dining areas with a seasonal fireplace. Relaxing, serene, and spacious are just a few words that describe the atmosphere here. Whether screen, open, or covered, you will want to spend all your times on the porches overlooking nature. Sip your morning coffee while listing to the breeze, enjoy a meal outside, or take up a game of cards. Inside you will find space galore and an abundance of amenities. From the soaring ceilings to the gas log fire place to the movie theater and table games, there is something for everyone to enjoy. Perfect for meals together, this home offers dining for 14 all at the same table. Plus an adjacent "kids" table and seating at the snack bar, there is more than enough space to fill your bellies while your fill your soul with memories. The adjacent kitchen has recently upgraded stainless appliances plus everything you would need for a meal at home. The bedrooms at Great Escape are comfy cozy, with a Master bedroom offering a fireplace, all of which offer a wonderful retreat at the end of the day. Several bedrooms also offer luxurious seating for when you want a quiet moment to relax and enjoy a good book, or glass of wine in the evening with your loved one. Main level bedroom and bathroom are convenient for those who may not be comfortable with stairs. Upstairs there are three bedrooms. The master bedroom suite offers a king size bed, private balcony, gas log fire place, sitting area, and full bathroom with walk in shower. Two additional bedrooms, both with a king size bed, a full bathroom with shower tub combo, and a laundry room can be found upstairs. The lower level of Great Escape is truly unique and offers many extras, comforts, and amenities for entertainment. The star of this level is the in home movie theater complete with 110" screen, theater style seating for 9, and even a popcorn maker. There is also a pool table and an air hockey table to keep you busy. Around the corner, but still open, you will find a bedroom set-up with both a king size bed and a twin, and an additional twin bedroom (with its own TV) that can become private by pulling a curtain closed. 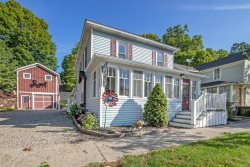 When you’re ready to head out and explore, this home is just minutes from downtown Saugatuck! Conveniently located to both town and Lake Michigan, you will have all activities at your fingertips. Take the secret, wooded hiking trail, or drive moments to the exciting, vibrant shops and restaurants of Saugatuck. If Lake Michigan is more your style, you have your choice of the Oval Beach, Douglas Beach, or Saugatuck Dunes State Park all less than 4 miles away. Great Escape is also conveniently just 8 minutes drive to the world-famous Oval Beach where you can lounge away your worries on the sandy shores of beautiful Lake Michigan. Your family couldn’t ask for a better vacation home to escape to than Great Escape! Shopping, eating, and exploring can also be found 15 minutes away in either Holland or Fennville. If you have the luck of rain during your stay, we highly recommend South Haven (25 minutes away) for a movie at their historic three screen theater and ice cream at Sherman's Dairy. Start planning your great escape to this fabulous home! Propane Fire Pit - New for 2018! *Please note that this 5th bedroom has privacy separated by a curtain. *King and 1 twin are tucked around the corner, but are open to the rest of the lower level, game section, and theater area.